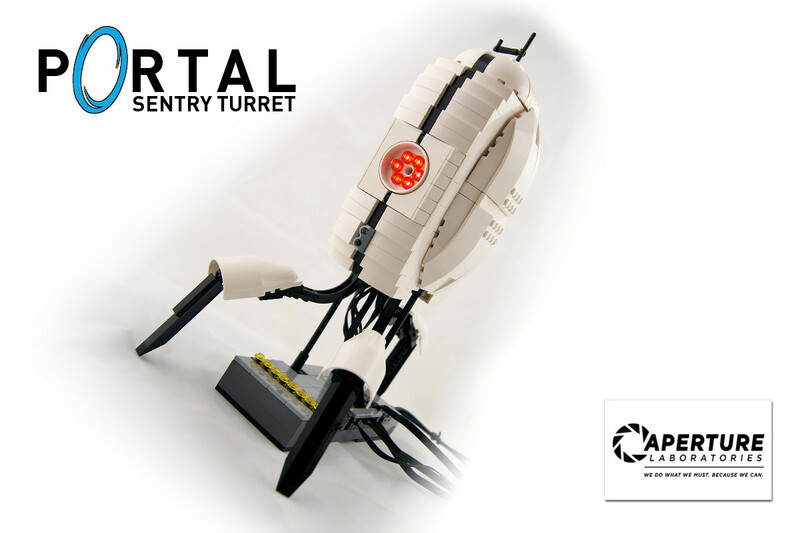 A model of a sentry turret from the Portal game. 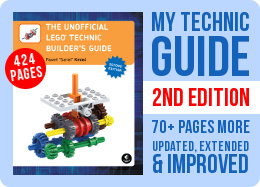 Features two motors and two sensors and is computerized with the Lego WeDo software. 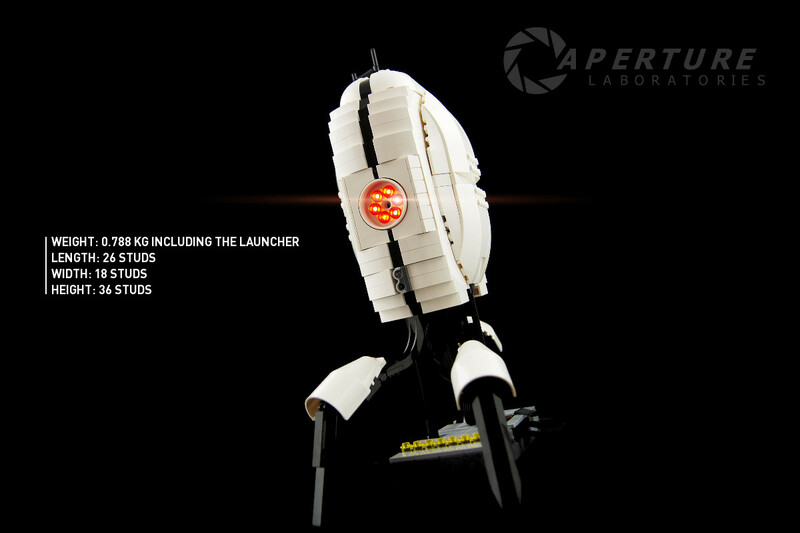 I was halfway through the Portal 2 game when this idea came to me. 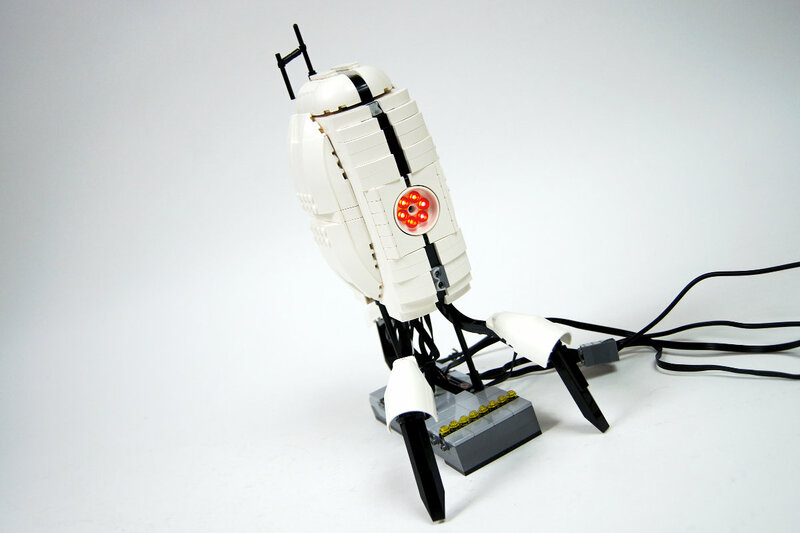 As you probably know, there are many Lego models of the famous Portal sentry turret and other “characters” from the game, especially after the release of Portal 2, but they are usually just that – models, with zero functionality. I had a very ambitious plans for this construction, and I’ve spent a lot of time trying to realize them in vain. 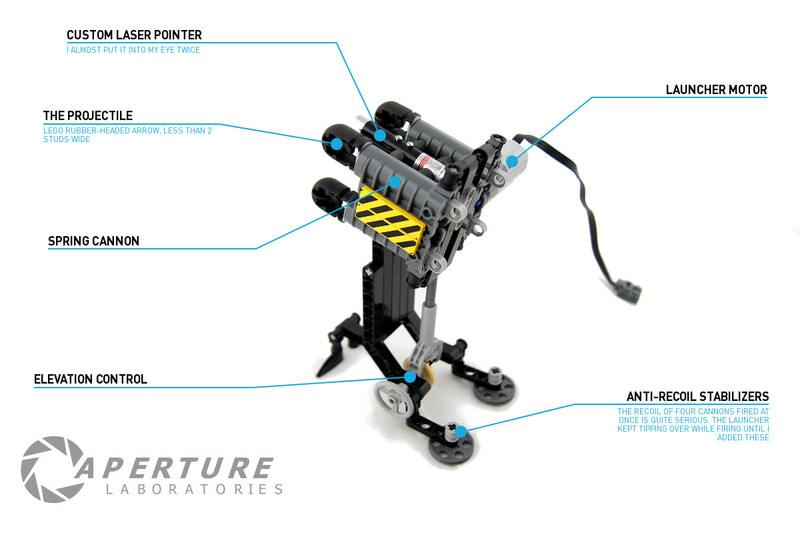 Among other things, I was trying to make the turret stand on its own legs and I wanted it to have Lego cannons inside it, with ability to extend and fire. The legs turned out too weak and the body of the turret turned out too small to house all the necessary mechanics – it was just 7 studs wide. 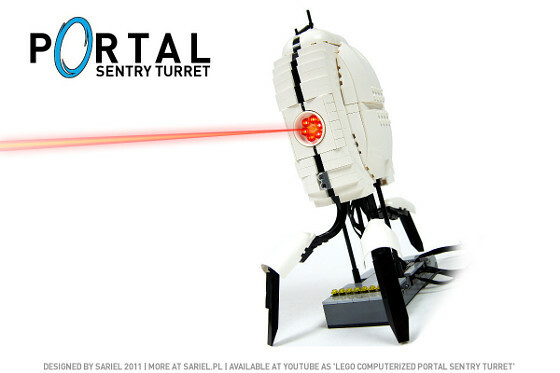 The size of the turret was determined by my decision to equip it with a studful, possibly accurate body. 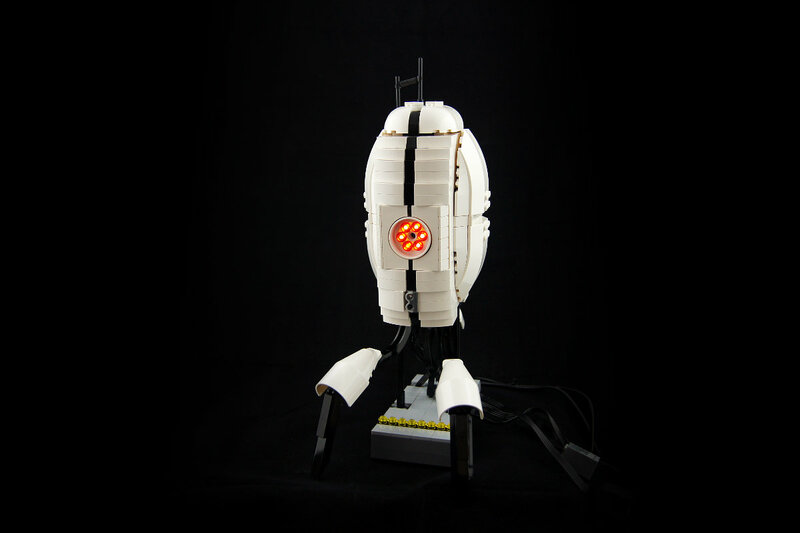 It was quite a challenge, as the original turret is egg-shaped. I was able to achieve the look I wanted using a variety of uncommon parts, and because of the parts it couldn’t be any bigger. 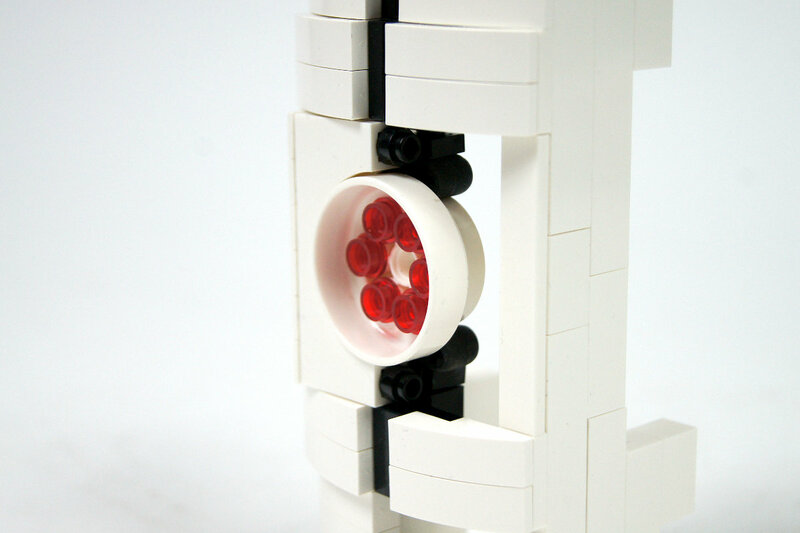 This is because almost every Lego piece used for its body has no larger counterpart. If the turret was to be made bigger, I would have to use several pieces instead of each single one used here, and it would pretty much ruin the look of the model. The elements that would be extremely hard to re-create at larger scale include the eye, the hole for the eye, entire legs – even the curved slopes the major part of the body is built with don’t come in larger size. Which pretty much means that a larger model would have to use an entirely different body. 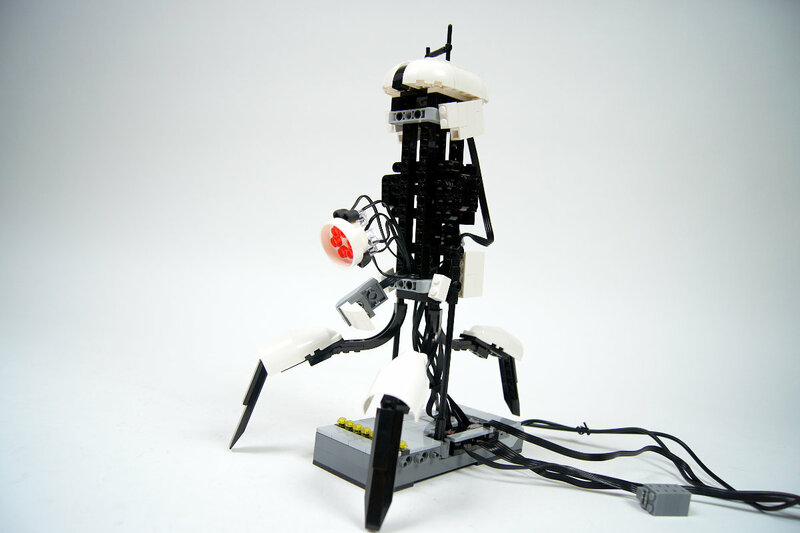 The body, which was quite a challenge to build, consists of five separate panels attached to a central studless skeleton. There are two identical extended side panels, rear panel, front panel with the eye and the proximity sensor and the top panel with the tilt sensor. It took a lot of planning to arrange them into one construction and to make it look as a whole. 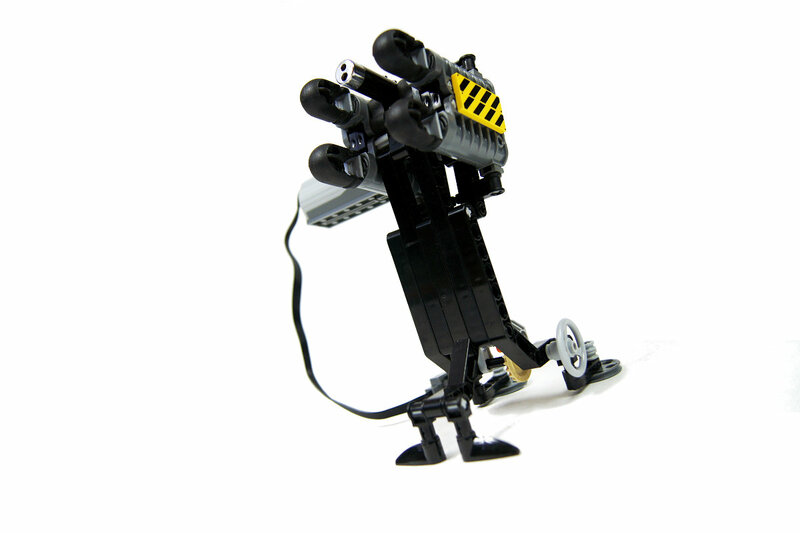 As for my work on the model, I have reached the point where I was able to have four Lego cannons inside it, together with a mechanism and a motor that could extend and retract them. However, I was unable to make them fire – I’ve tried a number of solutions, including most compact ones such as a string pulled by a motor. None worked. I have toyed with the idea of making only one side of the turret open, but the prototype firing mechanism I developed turned out so large, that even this was a problem. Eventually, I decided to remove the cannons from the turret and put them together as an auxiliary launcher, together with the custom laser pointer that didn’t fit inside the turret either. This way I was able to make both sides of the turret extend and retract, and the turret could control the launcher. 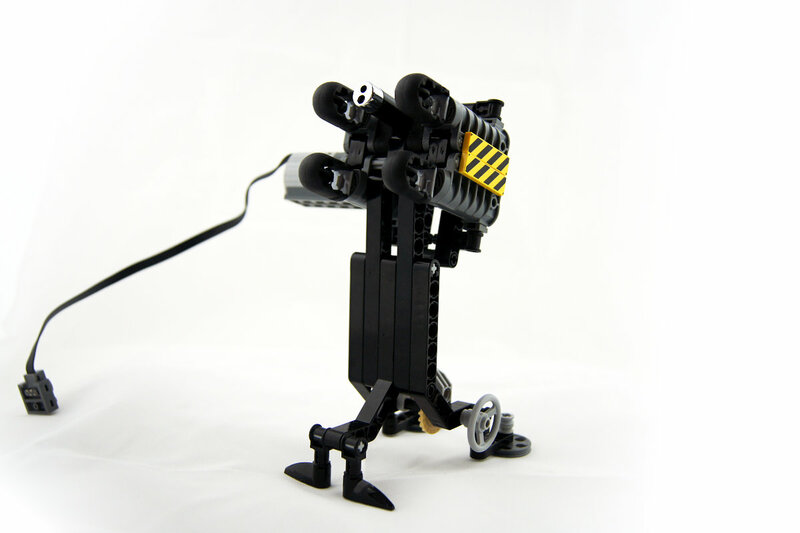 Building the launcher has shown yet another problem – the recoil from the four Lego cannons fired at once. It was quite significant and I had to add large stabilizers for the launcher to make it stop tipping over while firing. 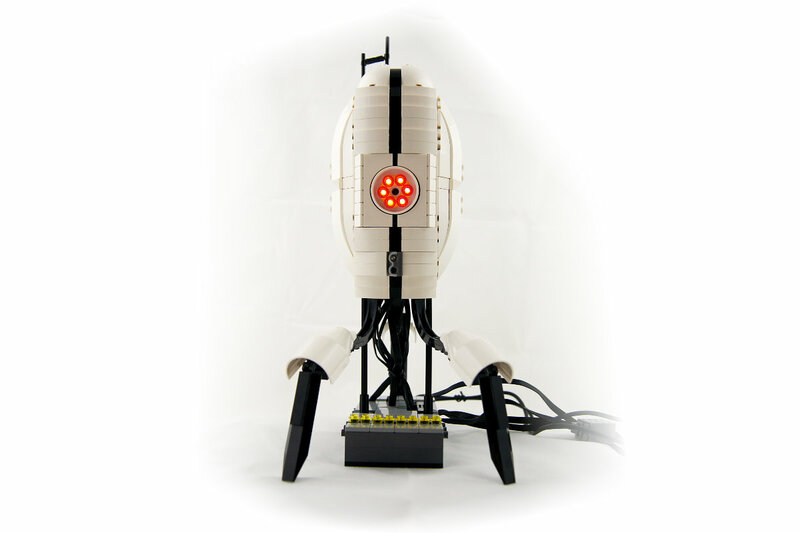 The number of wires coming out of the turret (total: 7) and its inability to stand on its legs made me create a stand for it. 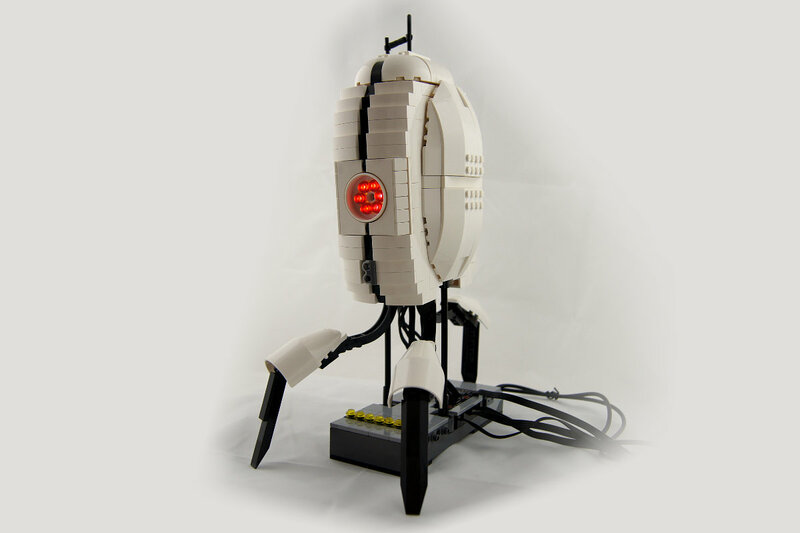 The stand supported the turret entirely, and housed the Lego WeDo USB hubs, as well as helped to arrange the wires. I was trying to make the stand look like a fragment of the Portal test chamber’s floor. 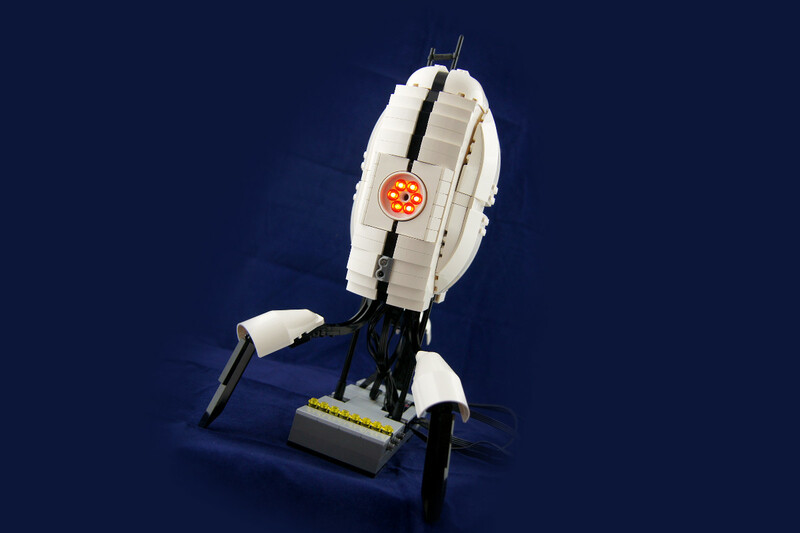 The turret was connected to a computer running the Lego WeDo software, which controlled the turret. There were two Lego WeDo sensors inside the turret: a proximity sensor located in front, below the eye (I was actually trying to install it behind the eye and make it look through it, but I was unable to stop it from detecting the pieces in front of it), and a tilt sensor located inside the turret’s top panel for increased accuracy. The side panels were extended or retracted by a micromotor rotating an axle with a simple system of levers attached to it. The launcher was controlled by PF Medium motor rotating another axle with a simple connector on it. 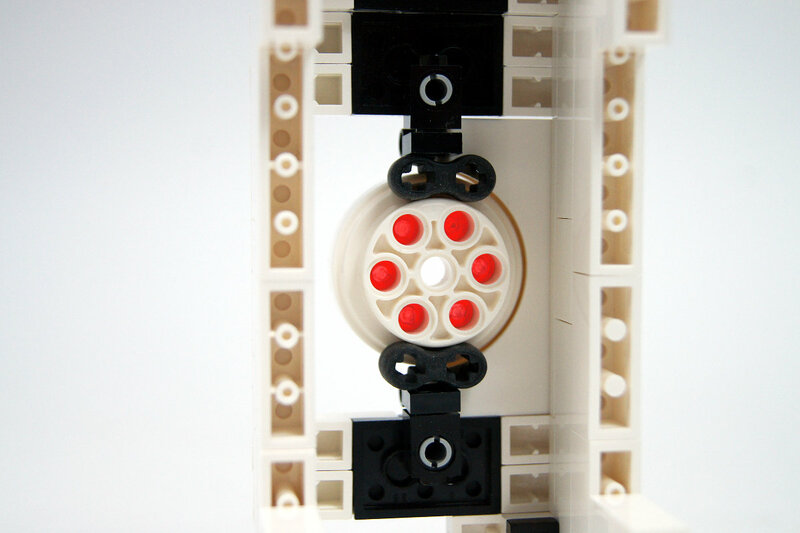 When rotated, the connector would push the vertical beams at the back of the launcher and pull all its four cannons’ triggers back. It was a very simple mechanism, but it required large torque to work, which was one of the reasons why I was unable to fit it inside the turret with some smaller motor. 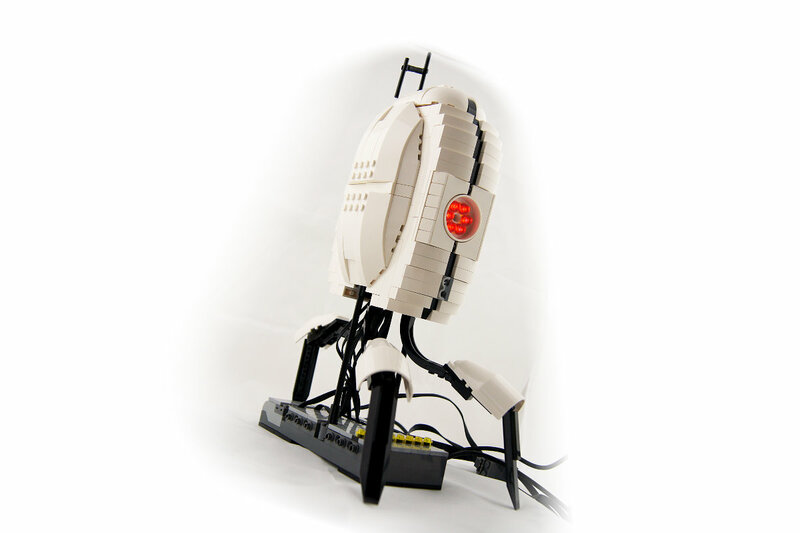 The WeDo program controlling the turret is the most complex one I have created up to date. 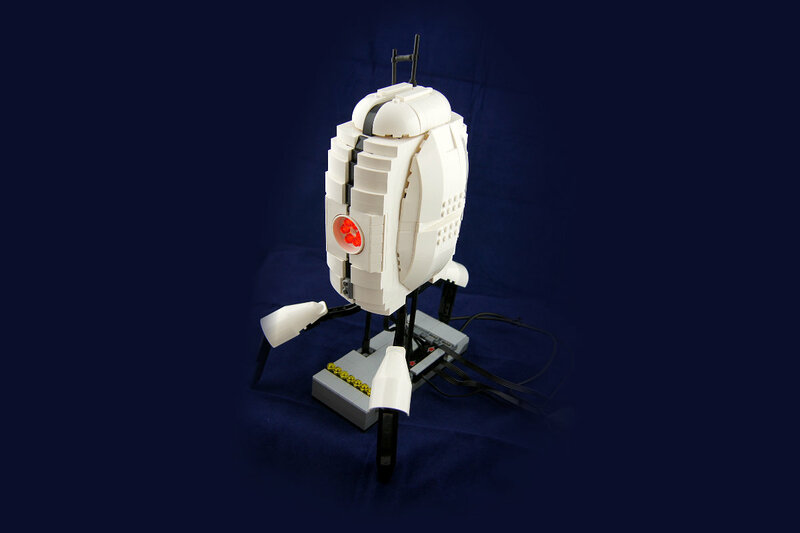 It uses the voice files of the original turret from the Portal game – I had to extract them, find the sound files of the Lego WeDo software and swap them to make it work, as the WeDo software doesn’t allow to use custom sound files. 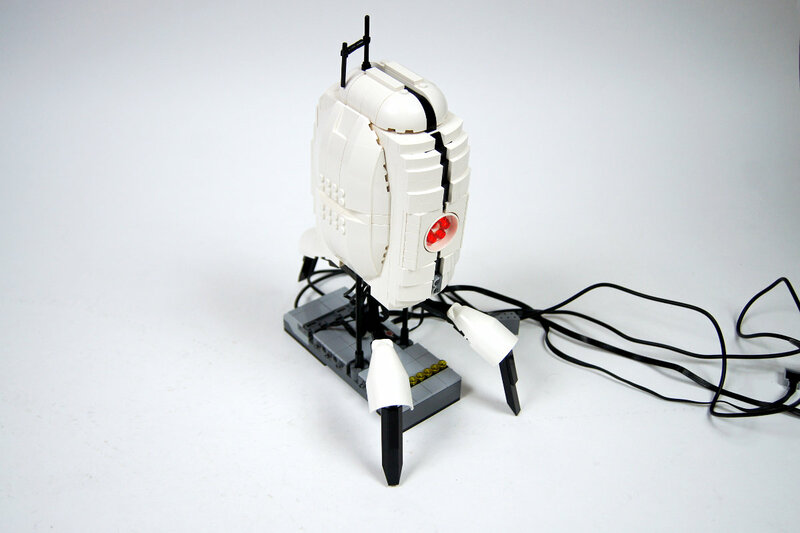 The turret is capable of recognizing direction it’s tilted in and can check if the target that appeared in front of it is still there – which is quite an achievement given the fact that the WeDo programming language doesn’t support conditional instructions. 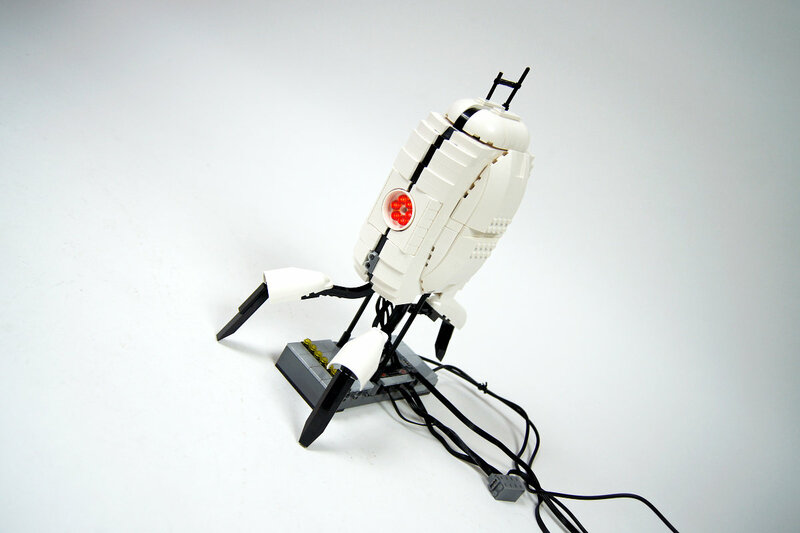 The turret is my first MOC to use white as the primary colour. 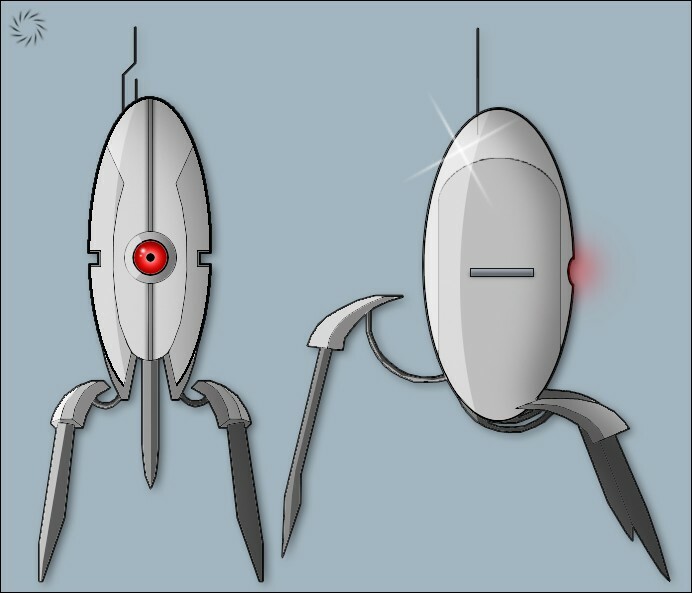 The portal 2 game theoretically introduced turrets in various colours, but the turrets we meet in the game are almost exclusively white, and the white version has become iconic since the first Portal game. 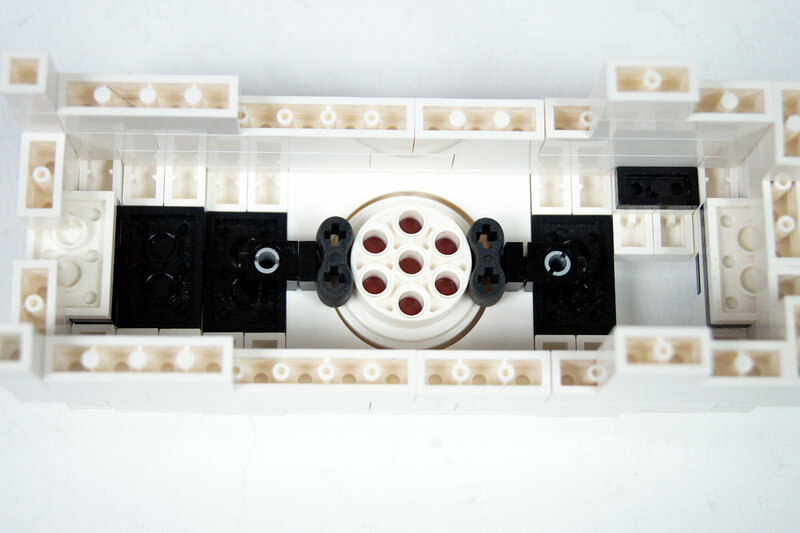 Every white Lego piece the model uses was bought specifically for it, as I had no white Lego pieces in good condition (that is not yellowed). 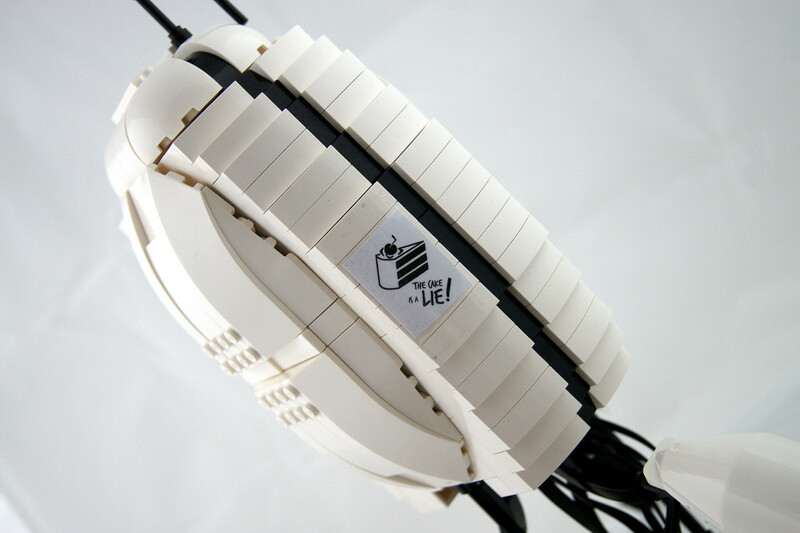 As I expected, a white model with black addition was a difficulty when it came to taking photos. I have even used a light tent with backdrops in a number of colours, but I wasn’t quite satisfied with the result. I guess I should have used a large piece of paper in some neutral colour, but I did not have one. 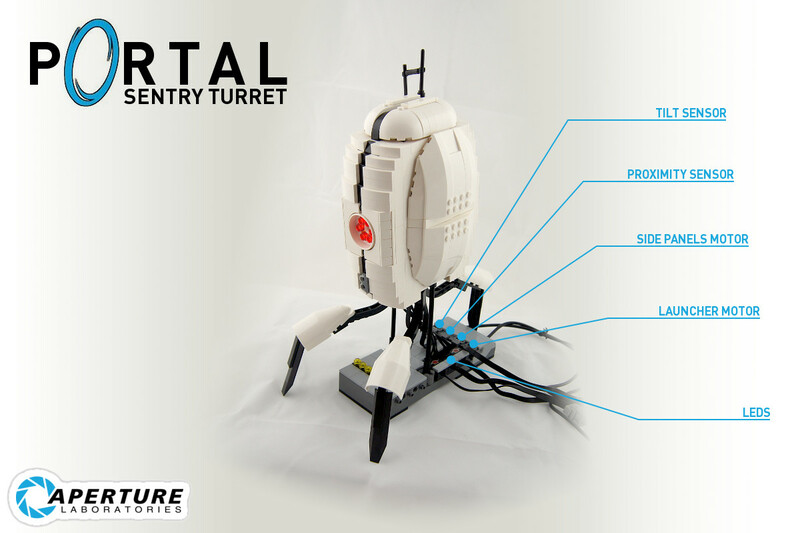 Despite the fact that the turret did realize a whole list of ideas, I was happy with it. I liked the look of it, and I had great fun working on the video. 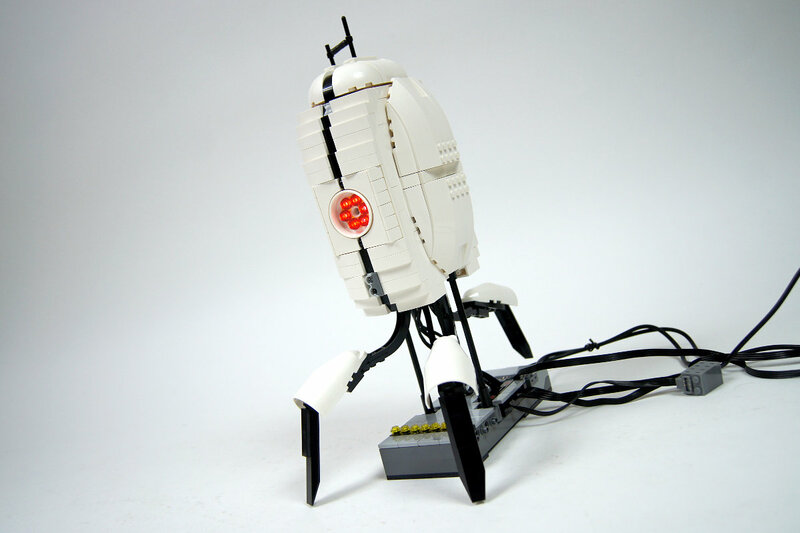 Using the sound files from the game turned out to work very well too, and I think that even if it’s not very successful compared to my other MOCs, it’s still very good in terms of Portal-inspired Lego models. what kind of rocket launcer is that? There can i get this? 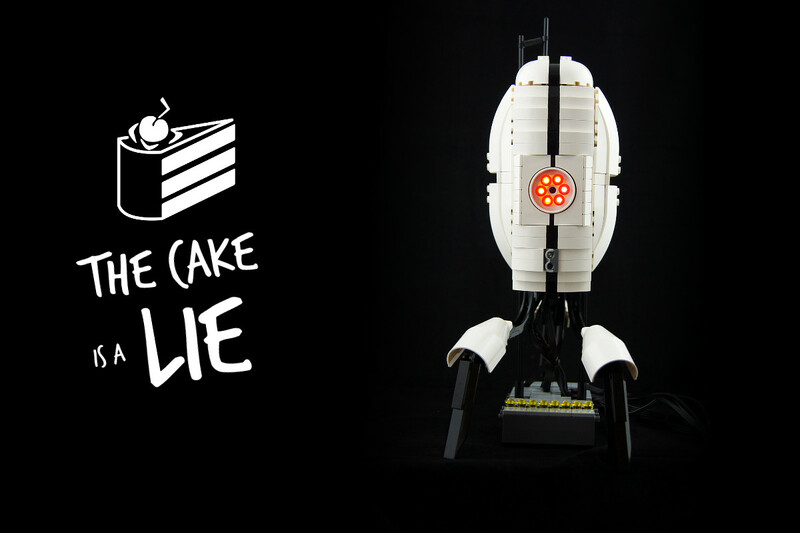 the cake is a lie! 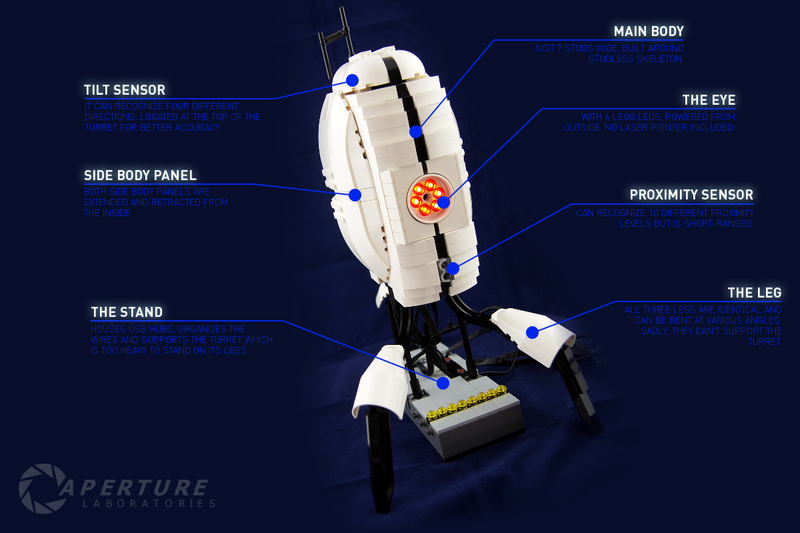 🙂 Maybe you should make a GLaDOS. Sure, except that I can’t make it bigger without making it look worse, as explained in description. 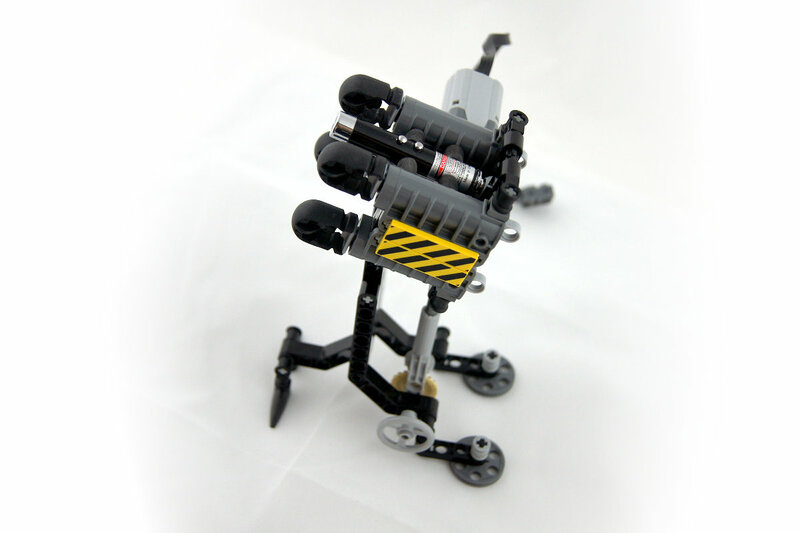 do you think that if you made the moc bigger it would work just fine to put the canons in and itll be more stable? must’ve been a hard creation to complete.but at least you finished it!but i got to agree. it is fragile! 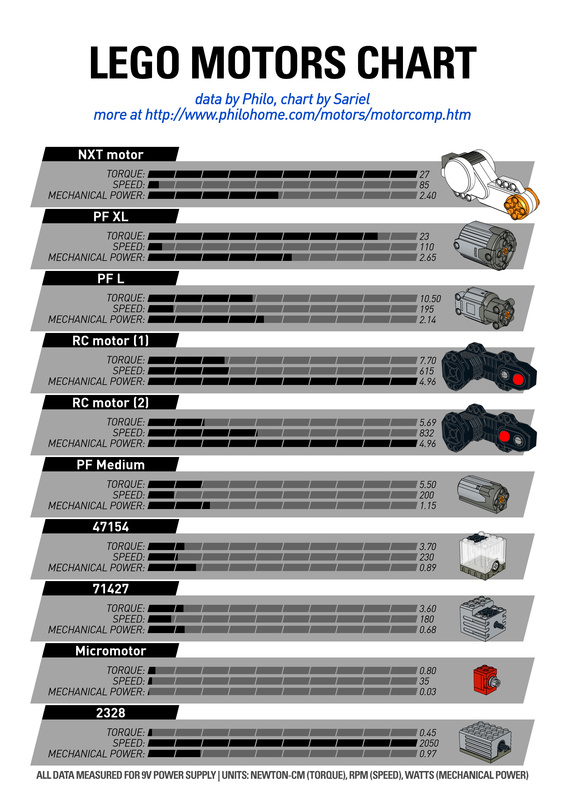 What camera do you use for the slow motion? More than a month I think, it took a lot of time to get the white pieces. omg, so sweet! 😀 But it must be very difficult to build it. 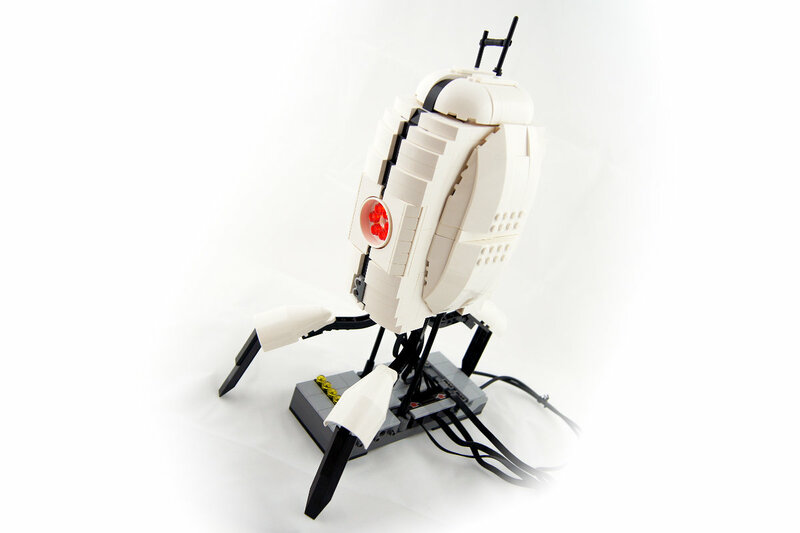 How long did you need to build and to program it? always entertaining to see someone else fumble with a finicky, fragile MOC!